The J.H. 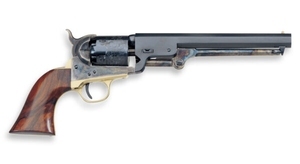 Dance & Bros is the fourth most important revolver manufacturer of the Confederacy, and the only one to have produced both .44 and .36 calibre revolvers. Based on the serial numbers found on the few guns that have survived, one estimate that a total of 350 .44 calibre revolvers were produced, and about 135 of the .36 calibre. The most remarkable characteristic of these revolvers is the lack of a recoil shield on most of them. 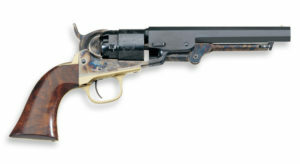 Spec: steel-framed, .44 caliber, 8 inch rifled barrel.